Jubilee Year of Mercy with Maryknoll’s 105 years of mission work around the world. During the Jubilee Year of Mercy, all Catholics, as “missionary disciples,” are to proclaim God’s love and mercy to their neighbors and those most in need. The Maryknoll Fathers and Brothers are celebrating the Jubilee Year of Mercy via online articles and social content, launching of new titles from Orbis Books, and with prayer and mission programs around the world. Have a Story of Mercy? We invite you to send us a personal “mercy moment” that you have witnessed—acts of mercy that you have offered to others, or moments when someone has provided you with an act of kindness. We’ll review and share many of these mercy moments on this page and via our social profiles, plus a selection will be displayed in the Maryknoll Museum of Living Mission at our Mission Center in New York. 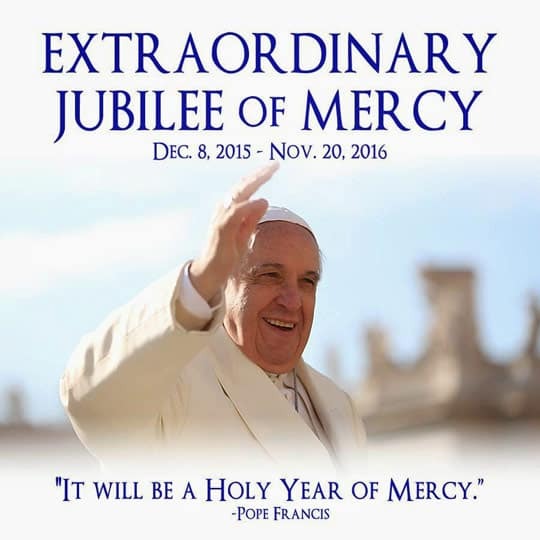 From Dec. 8, 2015 (the 50th anniversary of the closing of the Second Vatican Council) through Nov. 20, 2016 (the end of the liturgical year and Feast of Christ the King), the Catholic Church around the world will celebrate a Jubilee Year of Mercy. The more Love and Mercy that I try to share with others… …the more I get back (without asking). A Life of/in Service to others is indeed a wonderful Journey! I will appreciate every day as a Gift – and another opportunity to be of service to the poor and marginalized in most need. In this Year of Mercy, this month I am reflecting on how I need to re-start past volunteer work in a local Hospice for those in most need of Love and Compassion at this stage of their Life Journey. Dear Lord and Our Lady of Maryknoll, Thank you for Your unconditional, everlasting Mercy – never giving up on us, regardless of when we, like the Prodigal Son, wander away at times. Pray for those who are in need of mercy and who are suffering from poverty, wars and violence. Our church donated winter jackets to homeless shelters. We are grateful to the many generous folks who made this possible. The Eastbay Maryknoll Affiliates are teaming up with the local Buddhist community for a food drive this Thanksgiving. The experience of working together in compassion has truly been an experience of true mercy. I experienced mercy in my small Christian community not only in breaking open the word but more so when others really listen to my story. My congregation arranged supplies to help children from poor families attend school in East Timor. I volunteered in my local homeless shelter for a week.